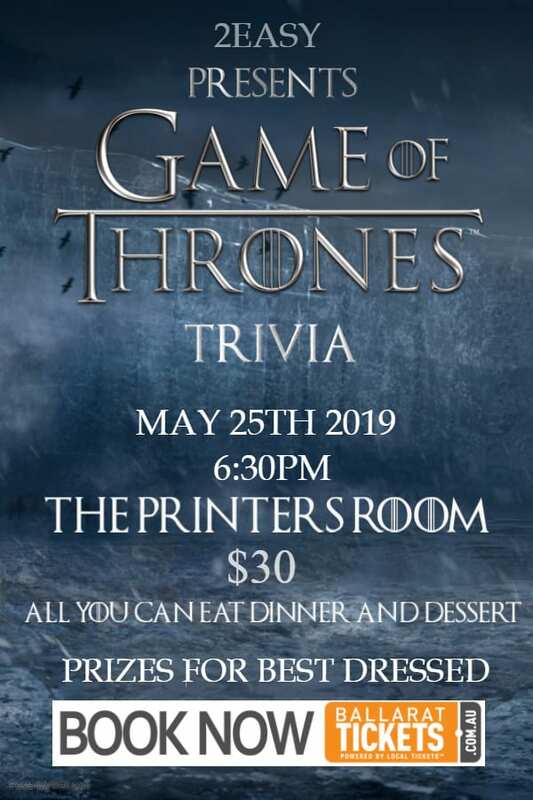 You're invited to 2EASY's Game of Thrones trivia night, and when you play the Game of Thrones, you win or you die (of shame). You've been summoned to The Printers Room at sunset (AKA: 6:30PM) on May 25th of this year to bring glory to your house in a true test of your knowledge of the 7 kingdoms. Entry to this tournament is 30 coins with a buffet feast fit for a King included (dinner and dessert). Wine and other beverages will be available at bar prices. And what of prizes you ask? Well lets just say 2EASY always pay their debts. So grab your armor or finest dress and rug up because Winter Is Coming. And if you think this has a happy ending, you haven’t been paying attention. (Tables of 6-8 are recommended).